Enjoy yourself in a wonderful townhouse with full kitchen, 4 bedrooms, loft and outdoor deck tucked away in the beautiful Laurel Mountains of southwestern Pennsylvania. Resort is 60 miles east of Pittsburgh and 20 mile west of Somerset. Skiing and golf course are located on the resort property. Contact owner for holiday, monthly or seasonal rates and availability. No smoking or pets. Security deposit required. toilet, combination tub/shower, Jack and Jill Bathrooms surround Tub/Shower Room. First floor Jack and Jill bathroom shares tub/shower space. Second floor bathroom includes tub/shower. Five minute walk to ski-in at Hidden Valley Ski Resort. Seven Springs Ski resort is 17 miles. Hidden Valley Resort is adjacent. The living area is great for any gathering with a spacious kitchen with counter bar and dining area for 8 that looks out over the sunken living room and wood burning stone fireplace with cathedral ceiling to the loft on the second floor. The master bedroom is also sunken with a king size bed and French doors into a private den/sitting room surrounded by windows and a skylight to enjoy the wooded view in summer or snow falling in winter. A bedroom with queen sized bed and 1.5 bath rooms are located on the kitchen level. The second floor has a full bathroom with shower, two bedrooms and a loft. One bedroom has two single beds and skylights, the second bedroom has a queen-sized bed and the loft contains a queen-sized futon and twin sized bed. Amenities includes 2 TV's, Cable TV, DVD players, WIRELESS INTERNET ACCESS, stereo/CD player, microwave, dishwasher and washer/dryer. Awesome property. The description does not do it justice. 4 nice size bedrooms plus a loft. Great property. 4 nice size bedrooms plus loft. We would definitely rent this property again. 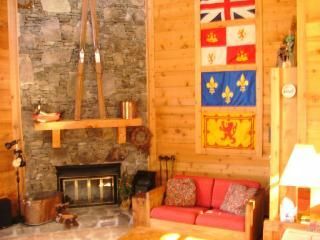 Great lodge, plenty of space with a very cozy and rustic ski lodge feel. Had a great time! Perfect location, lots of space for the 7 of us, with comfortable bedrooms and everything we could want. Although the townhome is somewhat dated, it offered all the amenities necessary for a comfortable stay. The bedrooms were very nice sized and the living area/dining area easily accommodated our party of 10. The townhome is very close (5 minute) walk to Hidden Valley slopes. Overall, a very comfortable stay for the cost. Monthly rentals also require payment for electricity usage that is not included in published rates--please discuss with owner. Check in is at 4 pm on your arrival date (owner permission is needed for earlier check in.) Check out is at 12 pm on your leaving date (owner permission is needed for late check out.) No pets are permitted in the townhouse. Smoking is not permitted in the townhouse. Bed and bath linens are provided. There is access to both of the Hidden Valley Foundation outdoor swimming pools during the summer Your security deposit may not be refunded if you cancel your reservation and the unit goes unrented or if there is damage to the unit. Owner or renter may cancel reservation 30 days prior to stay.